When Israel had the opportunity to go up and possess the land the Lord gave them, instead of welcoming the opportunity they shied away from it. They saw some giants in their promised land and were terrified to face them because they looked bigger and stronger. However, these enemies were certainly no bigger or stronger than the enemies they had faced previously back in Egypt. It appears whenever they face a new challenge; the blessings, deliverance, and miracles the Lord previously performed were a thing of the past and quickly forgotten. They developed a fear pattern that continued to plague them, and it kept resurfacing each time they faced a new challenge. No matter how many times the Lord proved He was almighty, and nothing was too hard for Him; this spirit of fear lingered in their lives. My child, is this what you’re dealing with today? Has the new challenge cause you to forget Who I Am? Have you forgotten how I delivered you the last time? Why do you think that I can’t do it again? It’s time to face the giants in your life in faith. Don’t run from situations that come against you and stop allowing them to intimidate you. I didn’t give you a spirit of fear. The things you don’t address today will follow you into tomorrow. Don’t let the giants of your past follow you anymore. Face the giants in My Name and stop allowing them to hinder you from reaching your destiny. Be strong and of good courage, as My Joshua and Caleb were and face the giants. Caleb and Joshua were ready to go into the land and face the enemy and claim the promises of the Lord. The giants in the land didn’t intimidate them. He recognized they could do it. They believed the word I gave them and remembered I would never leave them nor forsake them. I am the same, yesterday, today and forever; I change not. Therefore, recognize that with Me; you are more than a conqueror, and you can face and defeat the giants. There is more standing with you than with the enemy. Now, stop running from the giants. 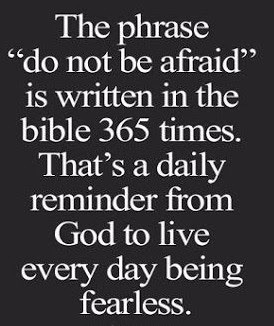 Be not afraid, nor dismayed. Have faith. 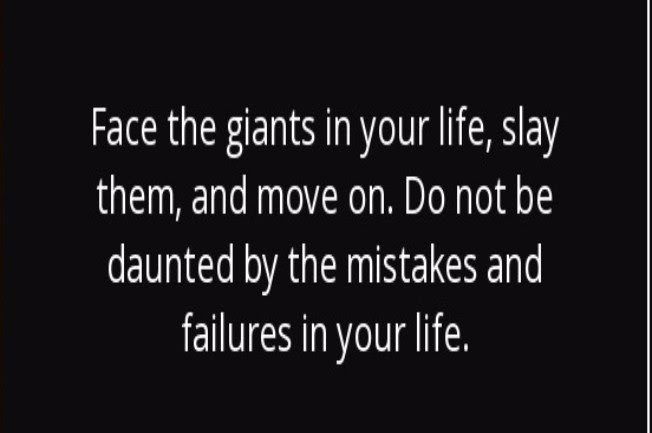 Rise up, and face the giants in your life. I am with you, and you are well able to overcome them. Num. 13:30 And Caleb stilled the people before Moses, and said, Let us go up at once, and possess it; for we are well able to overcome it. 2Ki. 6:15-16 And when the servant of the man of God was risen early, and gone forth, behold, a host compassed the city both with horses and chariots. And his servant said unto him, Alas, my master! how shall we do? And he answered, Fear not: for they that be with us are more than they that be with them. Mar. 9:23 Jesus said unto him, If thou canst believe, all things are possible to him that believeth. Jer. 32:27 Behold, I am the LORD, the God of all flesh: is there anything too hard for me?